The world is different following adoption of the Paris Agreement on 12 December. We now have a new orientation for the global economy set by the ambition of governments to put a limit to climate change. Of course there is much to be done to realise this ambition but economic analysis and growing experience bring confidence that transformation of economic activity on the scale necessary is well within reach. If any success has many fathers and mothers, this one has thousands—of politicians, negotiators, civil society representatives and researchers for whom the Paris Agreement was the outcome of great effort, in some cases over many years. But it would be churlish in the immediate aftermath of COP21 not to acknowledge that primary parentage belongs to the French government. For the last year they guided preparations strategically and cautiously, listening carefully for feedback. As in the case of Australia, they quietly nudged along promising developments. In the last hours of the COP though they moved boldly, raising the stakes for all participants and making it clear that any last minute troublemaking of the sort that scuttled previous COPs would bring global opprobrium. The choreography worked well and those present witnessed a result the like of which most diplomats see only a few times in their careers. If there was a key to the French achievement it was their capacity to maintain vertical integration of diplomatic effort. French diplomats all around the world were kept in the loop and knew that if needed, the whole weight of French influence, including the President, could be brought to bear to resolve a problem. Even with the support they received from others, especially the US, few countries could have matched this coherence and studied calibration of pressure at global scale. Summaries of the main aspects of the Agreement and its accompanying non-binding decision can now be found in many places. Two related elements justify the description of the deal as transformational: its level of ambition and its requirement for universal participation. The ambition is almost disguised in a convoluted formulation in Article 4 of the Agreement which commits governments collectively to delivering net zero emissions before the end of the century. This supports the more visible recommitment in Article 2 to contain warming to less than 2 degrees Celsius above pre-industrial levels and the welcome new pledge to “pursue efforts” to limit it to 1.5 degrees. The latter was the most controversial point of the package. Saudi Arabia resisted it on behalf of fossil fuel producers whose interests were transparent. India argued that the goal was fanciful if rich countries did not commit to much greater financial support for developing countries to reduce their emissions. The Indians worried that such a goal would implicitly limit the atmospheric space for their development. In developed countries some scientists and policy people were concerned that setting a goal that was out of reach would play into the hands of deniers and other cynics. 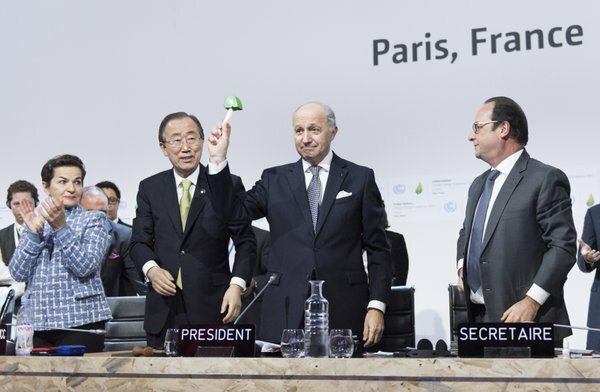 COP21 would be depicted as a failure if it did not set a trajectory to reach the agreed goal. In the event, a sufficient number of researchers attested that a 1.5 degrees goal was prudent and achievable for objections to be unsustainable. Australia’s support for the inclusion of the 1.5 degrees goal will have helped repair damaged relations with Pacific Island countries who were its most fervent supporters. Universal participation in mitigation efforts has been a – perhaps the – major objective of Australian governments in the climate negotiations since before COP1. Even then it was obvious that the arithmetic of global emissions could not add up to success unless all major emitters were included. But until now, only developed countries have had specific legally-binding obligations to reduce emissions. This undermined policy development at home by amplifying competitiveness concerns and also fed the key divisions blocking progress in the UN process. The Agreement confirms that all parties will have to make emissions mitigation commitments and report progress. But it does recognise that developing countries will rely on support from the developed world in their efforts and acknowledge that their accounting and reporting systems will take time to develop. This is an exquisitely delicate balance that reflected deft handling by France but also a moment in international relations when political will made such a result possible. Indeed, with becoming modesty President Hollande acknowledged that COP21 was buoyed by political momentum not available at the time of the Copenhagen meeting of 2009. Certainly the agreement a year ago by Presidents Obama and Xi to collaborate in the negotiations was extremely important and US diplomacy played a continued strong supporting role including down to John Kerry’s presence in Paris. But the seeds of the success of COP21 were sown in Copenhagen (and its preparation) and some critical ones by Australia. Before COP21 opened, almost all countries had published commitments on climate action in so-called Intended Nationally Determined Contributions. These up-front development plans provided participants with an enormous incentive for a positive outcome. They are a slightly modified version of the “schedules” that Australia proposed in advance of Copenhagen as a vehicle for universal participation. Inclusion of the 1.5 degrees aspiration among the purposes of the Agreement followed a compromise at Copenhagen on a 2015 review of the objective that was personally brokered by Kevin Rudd, one of the main authors of the Copenhagen Accord. The Accord can be seen in retrospect as a draft of the Agreement. It fell to President Hollande at the high point of COP21 to point to the fundamental significance of climate action—peace. The impacts of climate change are magnifying pressures on vulnerable communities and countries and increasing the prospects of conflict. Although the national security community in Australia has been slow to appreciate the implications, climate change is not just a major challenge to the Australian economy but also to the most basic of national interests. Climate change policy has waxed and waned with singular amplitude in Australia but it must become a top priority while national interests remain in jeopardy. The Australian delegation in Paris was talented and well-led. It advanced Australia’s interests and played a full role in the meeting’s success. The sense of relief from other delegations that Australia was back in the mainstream was palpable and became an asset for the delegation. The Government should ensure that Australia continues to provide its most effective people in departments at home and delegations abroad for furthering climate change policy, an issue that must become a top priority national endeavour. Howard Bamsey is currently a visiting Adjunct Professor at the Regulatory Institutions Network, College of Asia and the Pacific at the Australian National University and was previously Deputy Secretary of Australia’s Department of Climate Change and Energy Efficiency, and Australia’s Special Envoy on Climate Change. He attended the COP21 in Paris. Image courtesy of Twitter user @UN_Spokesperson. This piece was originally published on the AIIA’s Australian Outlook site.